But when they’re crisp enough to keep their shape and are still soft in the middle–that’s where it’s at. After realizing that gingerbread isn’t all bad, and that molasses isn’t anywhere near as bad as it smells once you combine it with sugars and spices, I realized I like gingerbread. 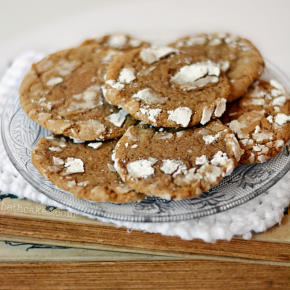 And I actually like it best beyond the classic cookies–in all different forms! 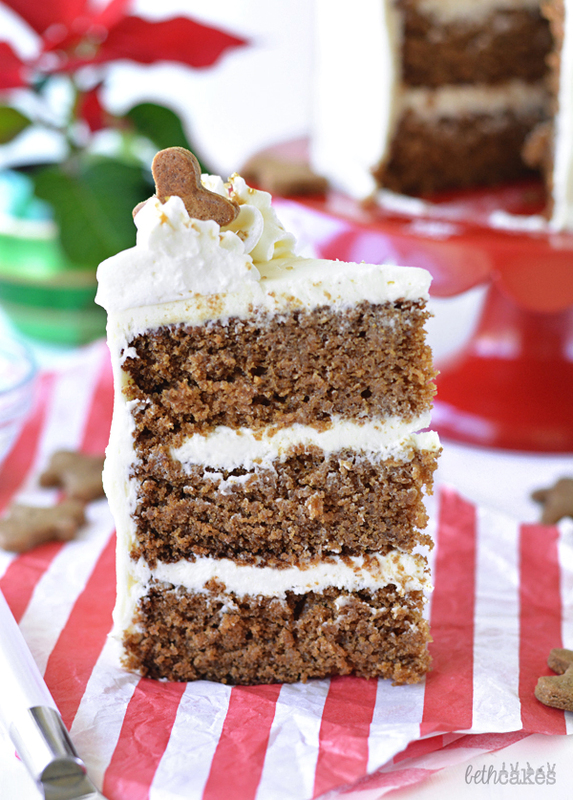 I made this Bourbon Gingerbread Cheesecake last year, as well as these Gingerbread Crinkle Cookies. There haven’t been very many cakes on bethcakes recently, so I figured it was about time for another one. 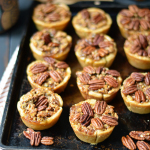 Plus I feel like show-stopping desserts are always a thing at Christmas. 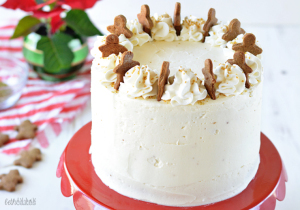 I don’t know that I’d call this one “show-stopping,” but not only did all the flavors of gingerbread transfer over to cake-form deliciously, they’re covered in a silky frosting and tiny gingerbread men! You can’t tell in the photos of the entire cake, but pretty much everything about it is miniature. The recipe makes enough batter for a regular sized cake, but I found this cute little cake stand at World Market last weekend and was dying to use it. The cake in the photo was made with 6 inch pans, and I also dug up a tiny gingerbread cookie cutter that I thought would be the perfect size for cake decorations. Luckily I also had some of this Brown Butter Maple Gingerbread Cookie dough left in the fridge! There is a flavor party going on in this cake, y’all. Like, the cinnamon and ginger are hanging out and belting some Mariah Carey, while the granulated and brown sugars are passing out hors d’oeuvres. The molasses keeps the eggnog coming, and then the maple and bourbon show up fashionably late in their tacky Christmas sweaters. My kind of Christmas party. 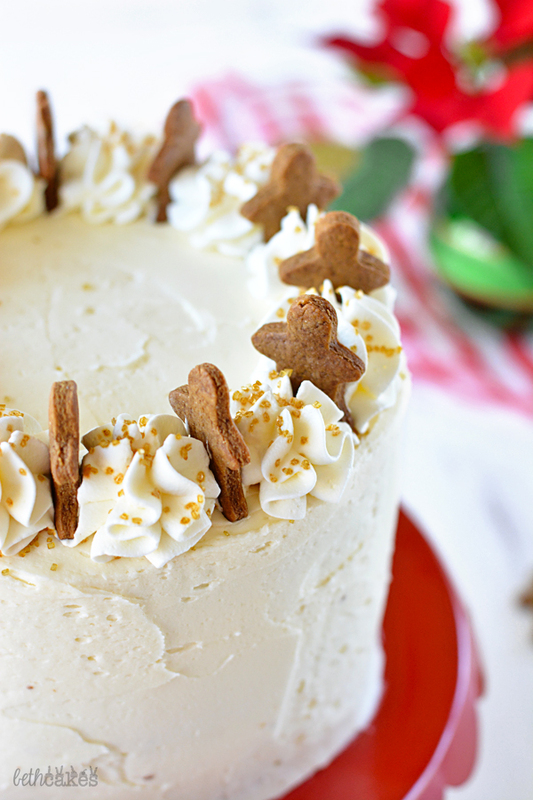 A fun and festive gingerbread flavored cake that's topped with silky maple bourbon frosting. Preheat the oven to 350 degrees and lightly spray three 8 inch cake pans with nonstick spray and line with parchment paper. In one bowl, whisk together the flour, baking soda baking powder, ginger, cinnamon, allspice, and salt. Set aside. In another bowl with a handheld electric mixer, beat butter on medium speed until smooth and creamy. Next, add the sugars and mix until combined and fluffy. Add the eggs and mix well. Then add half of the molasses, milk, and flour mixture. Mix on low speed until just combined. Repeat with the second half of the molasses, milk, and flour. Mix well. Divide the batter among the prepared pans and bake for 22-25 minutes, or until a toothpick inserted into the center of the cakes comes out clean and the edges have slightly pulled away from the pan. Let the cakes cool in the pans for about 10 minutes, then let them cool completely on a wire rack. In the bowl of a stand mixer, beat butter on medium-high speed until smooth and creamy. Add bourbon, maple extract, and half of the powdered sugar. Mix on low speed until just combined, then medium speed until completely combined. Repeat with the second half of the powdered sugar. If the frosting is too thick, add another tablespoon of bourbon. After frosting the cake layers, I topped my cake with some whipped cream, sprinkles, and little gingerbread men. You can do this or your own thing! Homemade whipped cream will work the best, and I believe my little cookie cutter came in a set of three from Hobby Lobby. 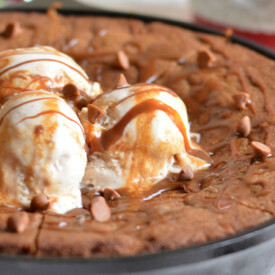 Haha – totally agree on molasses smelling so weird before being baked, and OMG this beauty of this cake! You always have the most adorable, creative cakes and it makes me so jealous! Love this. Pinned. I love this cake, Beth! The little gingerbread men are so cute. I’ve been loving gingerbread this year too and the combination with the maple bourbon frosting sounds amazing! Looks absolutely mouthwatering! You always have such amazing ideas, and I love that first photo! Eeps. this has got to be the cutest cake in the world! 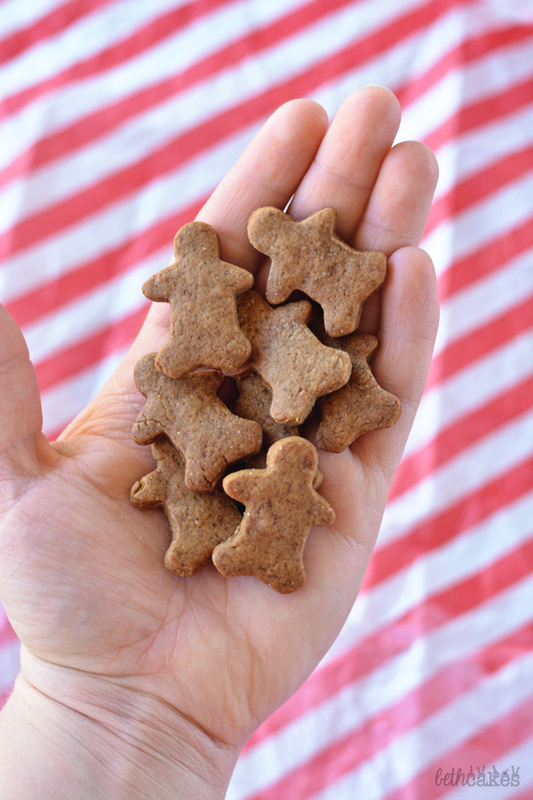 I love those little gingerbread men (and the flavor combo here sounds amazing). What a perfect holiday cake. Gorgeous cake! Sounds delicious too! This is the cutest ever! I love the little gingerbread men on the top of the cake like that! You have out done yourself with this one! Beautiful! ADORABLE!!! The maple frosting sounds too delicious!!! Beth, i’m so glad you realized that you like gingerbread so we could get this cake today!! because I love gingerbread!! 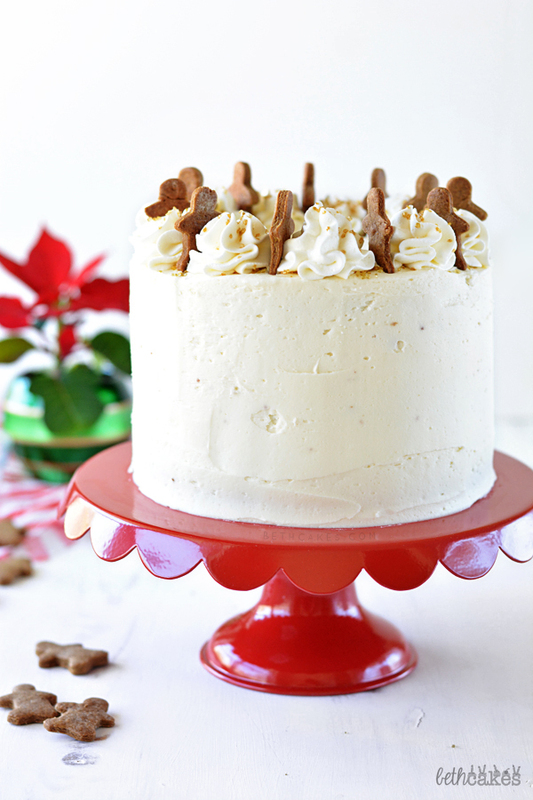 this cake looks soooo good. . love the mini gingerbread men and the maple bourbon frosting- yes!! and ha! that Mariah Carey song, All I want for Christmas. . is ALL I hear on the radio but I love it!! happy holidays! Looks delicious as always. I want make that Recipes for Christmas , thanks BETH for sharing. Love the look and flavors you’ve got going on here! What a perfect holiday cake! 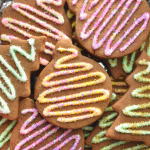 I’m so with you – I really didn’t realize how much I actually like gingerbread until this year! 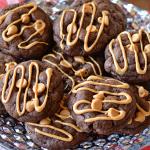 Minus those crunchy cookies – those are so not my thing!! And this cake looks out of this world!! And so pretty with those little gingerbread men! Bourbon Maple Frosting!! I think that’s the perfect way to frost a gingerbread cake. It’s stunning! what a stunning cake Beth!! 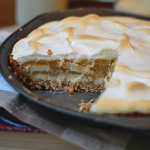 I am so into gingerbread this year and will just love a slice of this! This cake is stunning, Beth! I love the cute little gingerbread men. I’ve been loving gingerbread this year too and this cake is my favorite I’ve seen so far! That maple bourbon frosting looks incredible! This is seriously stunning!!! What a beautiful presentation! I am with you on the gingerbread flavor, I am not the biggest fan normally, but when it is done right I really like it! This cake is absolutely gorgeous Beth! Everything about it sounds amazing… Merry Christmas to you and your family! 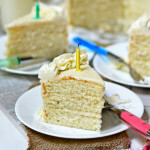 This cake looks delish and your photos are beautiful! Happy holidays! Mini gingerbread men on top were a nice touch! 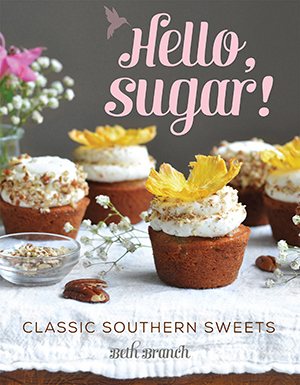 We your readers are getting some wonderful trickle down with your gingerbread obsession. I could easily dollop spoonfuls of frosting into my coffee in the morning. Plus you decorated it absolutely in a darling way. I would love to start my day out with this! Hi, would I be able to substitute the maple extract for maple syrup? If so, what would the measurement be? Thank you!